In a novel comprising seven short stories each of them influenced by a moon - flower moon, harvest moon, hunter's moon, blood moon - and travelling from 2073 back in time to the dark of the moon and the days of Viking saga, this is the story of Eric and Merle who have loved and lost one another and who have been searching for each other ever since. In the different stories the two appear as lovers, mother and son, brother and sister, artist and child as they come close to finding each other before facing the ultimate sacrifice. Beautifully imagined, intricately and cleverly structured this is a heart-wrenching and breathtaking paranormal romance, but it also has the hallmark Sedgwick gothic touch with plenty of blood-spilling, a vampire and sacrifice. Midwinterblood is made up of 7 stories, all set in the remote Northern island of Blessed. We start in 2073, when a journalist called Eric Seven travels there to investigate rumours that there's a flower that islanders cultivate and helps them live forever. There is talk that this is sold at a huge price to the richest people on the planet, very illegally. One of the first people Eric meets is Merle, a young woman he feels he recognises even though he's never seen her before. The other people he meets are all very helpful in terms of finding him somewhere to stay in this island without hotels and getting him food, but not in terms of answering any questions. Not that Eric is, after a while drinking the islanders' special tea, particularly interested in asking any questions, or even remembering that he meant to ask some. Things don't end well for Eric and Merle, and as we go back in time in the following stories, we realise their souls have met many times over the centuries, in all sorts of different circumstances. They've been brother and sister, mother and child, old man and young girl. Always on Blessed, always the powerful dragon-shaped flowers playing some sort of role. 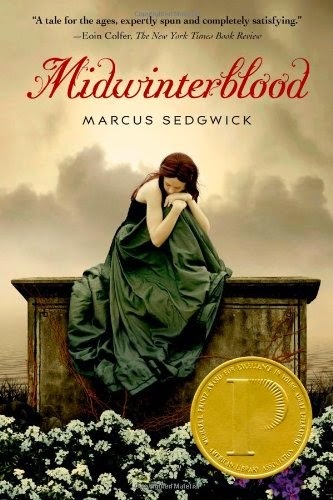 I thought the idea of Midwinterblood sounded amazing, but the execution of it wasn't to my taste. None of the stories were particularly interesting of themselves, all having boring characters and plots that just didn't capture my attention. I hoped at least the connections between the stories would end up gelling into something that would make the whole thing worth it, but they didn't. You'd see some things recurring and echoing, but it was all a bit pedestrian. And then there was the writing style. That didn't work for me at all. It's... well, the best way I can describe it is 'fairy-taleish' and sort of dream-like. It didn't engage me, and in fact, I felt it distanced me from the emotions that were supposed to be evoked by the story. This is supposed to be horror, but it wasn't scary in the least. It wasn't even creepy. You need to care about characters, at least to an extent, before you feel afraid for them, and the people and situations need to feel real before you are afraid for yourself. Oh no, this should be my catnip just from the blurb and I immediately thought of GREEN DARKNESS by Anya Seton. Alas, if it didn't deliver for you, I don't hold out much hope. Such a shame, thanks for reading it so I don't have to. It sounds amazing, doesn't it? *sigh* Maybe have a look at the Book Smugglers' review; they loved it! I liked bits and pieces of this (like discovering in "The Vampire" how the Viking burial in one of the earlier stories came about) but mostly I suffered the same problem of just really not connecting with any of the characters or really caring about them. And I never really understood the purpose of the flowers. It seemed like they were going to be so important ... but they kind of weren't? Of course they played into the plot several times, but I felt the story could have been exactly the same if they were growing opium poppies or something on the opposite side of the island. Some of those little details where you are given an explanation for things you've seen in the later-set stories were quite cool, but I never felt they were answering any burning questions, or had particularly important meanings. It all felt like a wasted opportunity, just like the flowers, as you say! Yes. Like the reveal that the tea was basically birth control -- that explanation was fine, but ... so what? The lack of children on the island was noted but didn't mean anything. It never went anywhere beyond "Hey, there are no kids" and "Oh, the tea is why!" So wasted opportunity, I think that's exactly right.